This post replace and update a previous post name “Tips, tricks and guidelines for specular cubemap” with information contain in the Siggraph 2012 talk “Local Image-based Lighting With Parallax-corrected Cubemap” available here. Image-based lighting (IBL) is common in game today to simulate ambient lighting and it fit perfectly with physically based rendering (PBR). The cubemap parameterization is the main use due to its hardware efficiency and this post is focus on ambient specular lighting with cubemap. There is many different specular cubemaps usage in game and this post will describe most of them and include the description of a new approach to simulate ambient specular lighting with local image-based Lighting. Even if most part of this post are dedicated to tools setup for this new approach, they can easily be reuse in other context. The post will first describe different IBL strategies for ambient specular lighting, then give some tips on saving specular cubemap memory. Second, it will detail an algorithm to gather nearest cubemaps from a point of interest (POI), calculate each cubemap’s contribution and efficiently blend these cubemaps on the GPU. It will finish by several algorithms to parallax-correct a cubemap and the application for the local IBL with parallax-cubemap approach. I use the term specular cubemap to refer to both classic specular cubemap and prefiltered mipmapped radiance environment map. As always, any feedbacks or comments are welcomed. – Infinite cubemaps: These cubemaps are used as a representation of infinite distant lighting, they have no location. They can be generated with the game engine or authored by hand. They are perfect for representing low frequency lighting scene like outdoor lighting (i.e the light is rather smooth across the level) . – Local cubemaps: These cubemaps have a location and represent finite environment lighting.They are mostly generating with game engine based on a sample location in the level. The generated lighting is only right at the location where the cubemap was generated, all other locations must be approximate. More, as cubemap represent an infinite box by definition, there is parallax issue (Reflected objects are not at the right position) which require tricks to be compensated. They are used for middle and high frequency lighting scene like indoor lighting. The number of local cubemap required to match lighting condition of a scene increase with the lighting complexity (i.e if you have a lot of different lights affecting a scene, you need to sample the lighting at several location to be able to simulate the original lighting condition). – Sampling K cubemaps in the main shader and do a weighted sum. Expensive. – Blending cubemap on the CPU and use the resulted cubemap in the shader. Expensive depends on the resolution and required double buffering resources to avoid GPU stall. – Blending cubemap on the GPU and use the resulted cubemap in the shader. Fast. 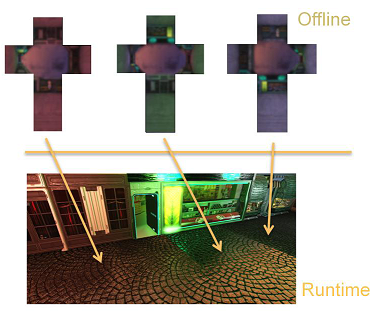 – Only with a deferred or light-prepass engine: Apply K cubemaps by weighted additive blending. Each cubemap bounding volume is rendered to the screen and normal+roughness from G-Buffer is used to sample the cubemap. In all strategies describe below, I won’t talk about visual fidelity but rather about problems and advantages. Each object is linked to a local cubemap. Objects take the nearest cubemap placed in the level and use it as specular ambient light source. This is the way adopted by Half Life 2  for their world specular lighting. Background objects will be linked at their nearest cubemaps offline and dynamic objects will do dynamic queries at runtime. Cubemaps can have a range to not affect objects outside their boundaries, they can affect background objects only, dynamic objects only or both. The main problem with object based cubemap is lighting seams between adjacent objects using different cubemaps.